In 2001, the University of Texas (UT) School of Public Health in Brownsville began clinical research to identify health risks in the community. Researchers found that 80 percent of Brownsville residents were either obese or overweight, one in three were diabetic (50 percent without knowing it), and 70 percent of residents had no health care coverage. Driven by these indicators, the UT School of Public Health launched a media campaign and formed a community advisory board to leverage the voices of community members to promote change within Brownsville. The Brownsville Farmers Market, whose goal is to make fresh fruits and vegetables accessible and affordable to every income level in the city. Policy changes including a sidewalk ordinance, Safe Passing ordinance, Complete Streets Resolution and Smoking Ban. Master Bike and Hike Plan aimed at providing a trail within one-half mile of every residence in the city. Build a Common Fact Base. Starting in 2001, the UT School of Public Health in Brownsville began compiling data on health in the community, finding high rates of obesity and obesity-related illness. That data became the driving force for the community advisory board’s work, galvanizing community members to approach public health as a broad-based, systemic issue facing their community. This highlights a key collaboration tactic The Intersector Project Toolkit refers to as Build a Common Fact Base — the consensus among collaboration partners as to what facts relating to the issue are most relevant. Joint recognition of what data are relevant to the collaboration allows participants to determine how best to proceed. Driven by a common understanding of the issue at hand, the community advisory board soon became an active body pushing for health-based initiatives. One of the first initiatives that the board participated in was a local media campaign called Tu Salud Si Cuenta, which delivered the UT School of Public Health’s research findings in a community-media-friendly format and celebrated ordinary people from the community making healthy choices that improved their diabetes and hypertension, and lowered their weight. This community-based media campaign — and a corresponding door-to-door outreach effort — helped create common community knowledge on the public health dilemma. Establish a Governance Structure. 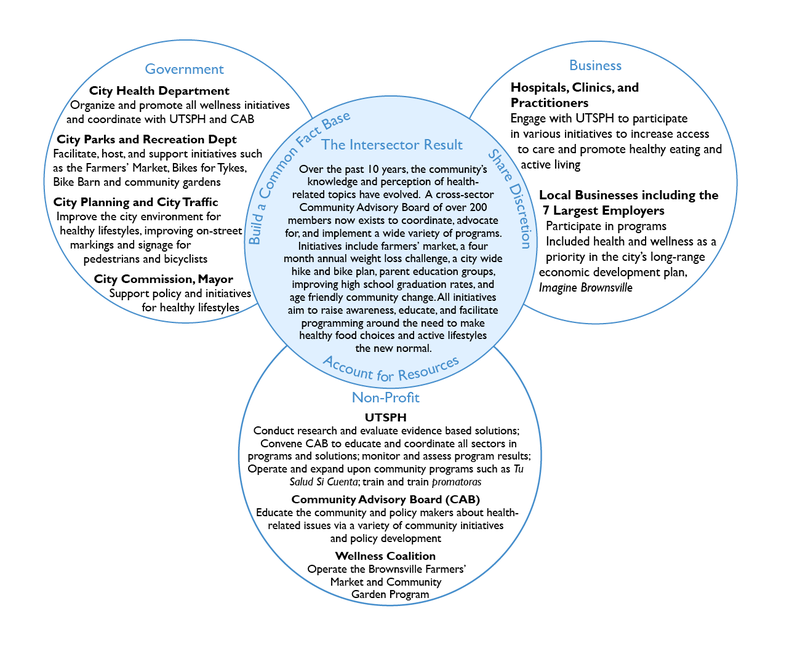 The community advisory board has four stated goals: to work with the UT School of Public Health researchers to ensure that health information and research is more accessible and more fully understood by Brownsville residents; to share information, collaborate and participate in forming networks and pursuing potential funding opportunities; to provide feedback on outreach and recruitment strategies and to lead policy and environmental change interventions in partnership with local government and community entities. The board breaks down into subcommittees based on interest and expertise. A five-member leadership team led by Belinda Reininger, associate professor at UT School of Public Health, sets the meeting agendas and runs the meetings, while the actions of the Community Advisory Board are undertaken by its subcommittees. The Community Advisory Board serves as a central body for community members involved in health programs to coordinate activities and set priorities. Members of the board approach the City Commission in their individual capacity to lobby for projects, like funding or zoning requests. Though each initiative is managed individually, the board creates a connection between programs and serves as a voice for a unified culture of health in the community. This illuminates a collaboration tactic The Intersector Project Toolkit refers to as Establish a Governance Structure — the creation of a formal or informal organizational system for project management. Clear governance structures, such as committees, workgroups or facilitated discussions, provide direction while ensuring equity and inclusivity to resolve actual or perceived power imbalances that can arise during collaboration. In Brownsville, health has been elevated to a citywide issue as individuals and groups have come together to build a strong network to support initiatives and ordinances for healthy living. While the initiatives’ long term outcomes will be measured in coming years, an important change has taken place. In a city where people believed “healthy” meant simply visiting the doctor and taking medicine, creating an understanding of health as a lifestyle through active programs, modifications to the city’s landscape, and the growth of a community board of over 200 people has changed the community. Residents engaging with local government through a structured Community Advisory Board have been key to that effort.